As we anxiously await summer, warm weather, and maybe a vacation, our days grow longer as our energy slightly wavers. Luckily, we can find a friend in food and use it as fuel to keep us going towards that finish line. Since what we lack most is time and energy we have found the perfect solution for y’all. 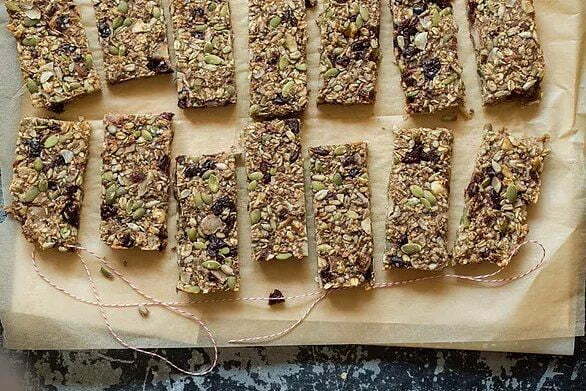 These delicious granola bars are both easy-to-make and are sure to give you that spark of energy you so desperately need. Not only are these bad boys super delicious and easy to make, but you can make a bunch at a time and eat them on the go. They are perfect for a pick-me-up first thing in the morning or during your 3 pm blues, they also make a great snack for your little ones. Also, feel free to use any nuts and fruits of your choice. Preheat the oven to 350F. Lightly grease a large rectangular baking dish (approx. 8.5″ x 12.5″) and line with a piece of parchment paper so the bars are easier to lift out. Chop the walnuts and dried fruit and stir these and the rest of the ingredients into the banana-oat mixture until thoroughly combined. Bake for 23-27 minutes (I baked for 25 mins.) until firm and lightly golden along the edge. Place dish on a cooling rack for 10 minutes then carefully slide a knife to loosen the ends and lift out. Place granola slab on a cooling rack for 10 minutes and then into the freezer for another 10 mins. (if you are impatient like me).